Laborers who work at the Male’ Commercial Harbor are holding a strike to express their discontent over the Transport Authority’s decision to restrict land transport of cargo in Male’ City. 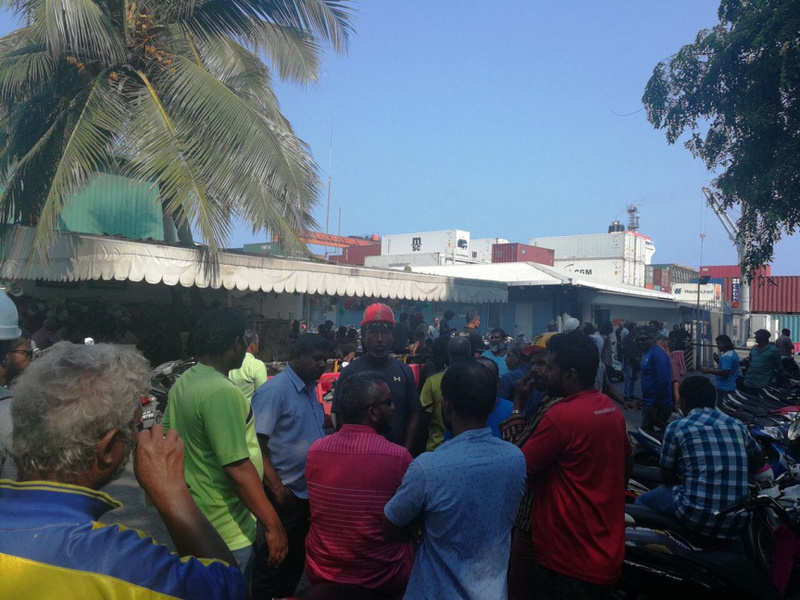 Almost all laborers at the Male’ Commercial Harbor are participating in the strike. They allege the decision to limit the time during which cargo can be transported within Male’ City has made their work harder. One of the laborers who spoke to “Sun” said having to work after 6 pm is a huge inconvenience to laborers. He said the restricts meant they had to work two times a day; during daytime to unload cargo from ships, and during nighttime to transport the cargo to warehouses and shops within Male’ City. TA issued an announcement last Friday, informing that transport of bulk products like wood, iron, gravel, glass, cement, construction material, drinking water, drink products and other such products for sale or warehousing within Male’ City will be allowed from 6 pm to 6 am. And cooking gas can be delivered from 8:30 am to 11 am and 6 pm to 6 am. The restrictions took effect this Sunday.